HYDROWATT pumps are generally designed for pressures up to a max. of 415 bar (6000 PSI). The wide range of pump sizes, with 5, 7, 10 or 14 pistons, means that an equally broad flow range is available, from approx. 20 – 800 litre/min (5 – 200 US-gpm). 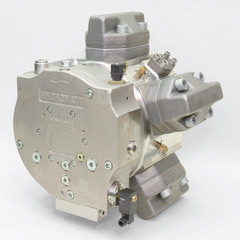 The pressure medium is hermetically separated from the drive lubricant, allowing high piston speeds. 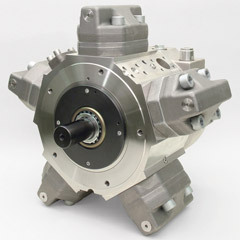 Ultimately this is what has allowed us to build this high-speed (drive motor speed), high pressure pump. All pumps are coupled directly to an electric motor with no gear box between. The standard speed ranges are: 1500 rpm (at 50 Hz) or 1800 rpm (at 60 Hz). All pumps can also be operated at variable speed (VFD). All HYDROWATT pumps are designed for heavy industrial use in continuous 24/7 operation.